Concrete paving: When building a new office or a new home, Maddox Concrete, LLC is there to take care of all of your concrete paving needs. 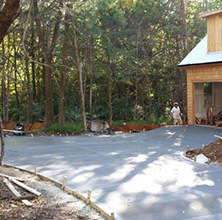 Whether you need a new driveway or a new sidewalk, Maddox Concrete, LLC can pave it. With emphasis on a high-quality finished product, you can trust our paving experts. Our concrete paving services are offered to Sanford, NC and all of the surrounding areas, up to 50 miles. Concrete replacement and repairs: Walking and driving over constant bumps and cracks is certainly not ideal and can even be potentially harmful or dangerous. Let Maddox Concrete, LLC fix or even fully replace the old, worn out concrete at your home or business. We can make your concrete beautiful, smooth and safe again. Hauling and demolition services: Hauling and demolition services in Sanford, NC are often needed when building something new from scratch or reconstructing an existing home or office building. Whether needed at your home or at your business, Maddox Concrete, LLC can get rid of your old concrete for you, allowing you to work with a fresh, clean slate. Stamped and decorative concrete: For custom decorative concrete in Sanford, NC, as well as stamped concrete, Maddox Concrete, LLC is the place to turn. We can help you create custom designs for your concrete, presenting just the look and feel that you want. At Maddox Concrete, LLC, we can also make your concrete resemble the design of cobblestone, rock, brick, tile and more with stamped concrete options. Above all else, Maddox Concrete, LLC is here to serve you. From decorative and stamped concrete to simple concrete sidewalks, we have it all. Call us today at (919) 353-2684 or stop in at 1022 Thomas Rd, Sanford, NC, 27330 to learn more about our dedication to superior service and high-quality concrete services.